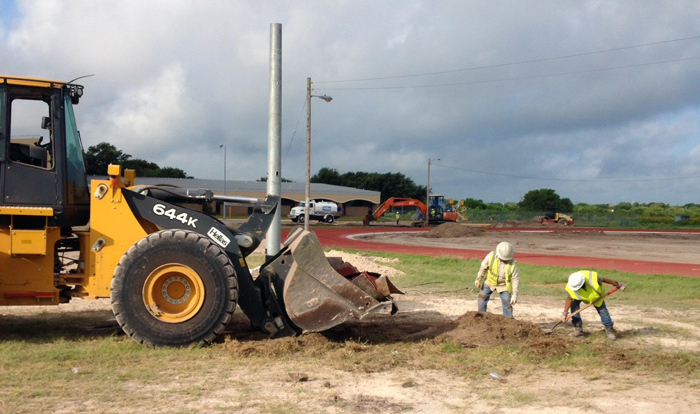 Austin, TX (June 17, 2015) — Hellas Construction broke ground on a Design/Build project at Freer, Texas for the development of football, baseball, and softball stadiums during the month of June after Freer ISD School Board approved the $5.73 million dollar project with a unanimous 7-0 vote on June 3rd. The first phase of the project comprises the conversion of Buckaroo Stadium’s natural grass field to Hellas’ Matrix® Turf with REALFILL™ infill, a highly demanded system that provides enhanced performance and greater playability for athletes. It also includes a new D-zone area with epiQ TRACKS® V300 running track surface that will offer the Buckaroos the privilege to hold track and field events. New bleachers will be added to home and visitor’s sides, as well as home section seats, stadium lighting, concession stands, restroom buildings, and a 62’ press box. Also included in the project are arched entryways, two ticket booths, fencing, a recycled concrete parking lot, new goal posts, and a flagpole. The second phase of the project will convert the Buckaroos’ practice football field to a new baseball and softball stadium. The current natural grass field will be replaced with a Matrix® Baseball/Softball Turf System with clay mounds and batting circles. New bullpens will be added featuring Hellas’ Matrix® Batting Cage Turf, a durable system that resembles mowed grass and is optimized for baseball and softball practice. Hellas will also provide warning tracks, bleachers, masonry dugouts with storage, fencing, netting systems, backstops, a restroom/concession building, decorative arched entryways, walkways with concrete flatwork, ticket booths, and a press box for each of the fields. 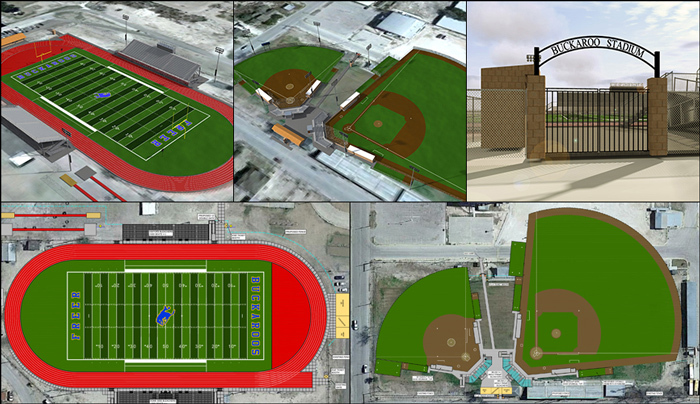 The first phase of the project is to be finalized before October and in time for the Buckaroos’ 2015-16 football season. The second phase is expected to be completed in early 2016.